When this large, drab shorebird opens its wings, a remarkably bold black-and-white pattern is revealed. It is the Western subspecies of the Willet that is a rare, but regular spring and fall migrant in Tennessee. It is usually found singly or in small numbers in the fall, but groups of over 100 birds have been recorded in the spring. This bird breeds inland, primarily in freshwater habitats of the western states and provinces, and winters on both coasts. The Eastern subspecies is about 10% smaller, restricted to the east coast, and may prove distinct enough to be split into its own species. 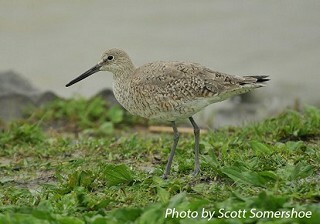 Description: The Western Willet is 10% larger and has a bill and legs that are 15% longer than the Eastern Willet. The body is overall grayish with a bold black-and-white wing pattern seen in flight. The legs are long and usually blue-gray, and the bill is long, straight, and black with a grayish or brownish base. Voice: The territorial call is a ringing pill-will-willet. When flushed they make a variety of calls including a monotonous wik wik wik. Greater and Lesser Yellowlegs are generally similar in appearance, but have yellow legs, a thinner black bill, and lack the black-and-white wing pattern. Habitat: A variety of habitats including marshes, mud flats, sandy beaches and sand bars, and rocky shores. Diet: Insects, small crustaceans, mollusks; occasionally small fish. Nesting and reproduction: The Willet has never been documented nesting in Tennessee. 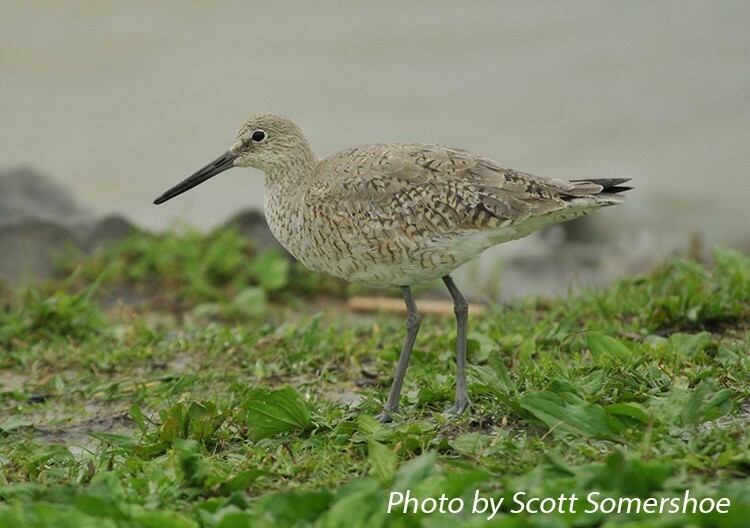 Status in Tennessee: Only the Western subspecies of the Willet has been recorded in Tennessee. It is a rare but regular migrant found singly or in small numbers in fall and occasionally in large numbers in spring. Spring migration is from early April through mid-May; fall migration is more prolonged lasting from late June into late September. Willets are more often found during bad weather and after heavy storms that force them to stop temporarily. The breeding range of the coastal Eastern and inland Western subspecies of Willets do not overlap. The subspecies differ in their ecology, morphology, and subtly in their vocalizations, and may be split into two separate species. The scientific name "semipalmatus" is because their toes are slightly webbed feet. Best places to see in Tennessee: Ensley Bottoms, Old Hickory Lake, and Tennessee NWR are good locations. Lowther, P. E., H. D. Douglas, III, and C. L. Gratto-Trevor. 2001. Willet (Tringa semipalmata), The Birds of North America, No. 579 (A. Poole and F. Gill, eds). The Birds of North America, Inc., Philadelphia, PA.